After a brief pause and a tepid start to the day, the Wednesday’ session saw some advancement in the NIFTY as the Index ended the day gaining 23.90 points or 0.22%. Bulk of the gains came in the second half of the session though the session remained dominated with highly stock specific activities. However, despite putting on modest gains, the NIFTY still remains little bit away from the immediate past high of 10785. As we step into Thursday’s trade, we expect a quiet start to the day. If there are no overnight surprises, we expect NIFTY to inch higher and attempt to test the 10785-mark. However, this level will still continue to pose and act as immediate resistance level for the Markets which is important enough to push Markets into some more consolidation. 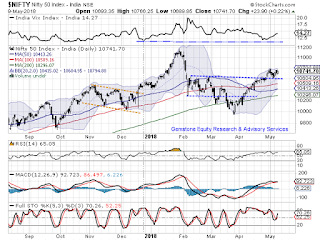 The levels of 10785 and 10830 will act as immediate resistance area for the Markets. Supports are expected to come in at 10710 and 10660 zones. The Relative Strength Index – RSI on the Daily Chart is 65.0525. RSI shows bearish divergence against the price as it did not mark a 14-period high while the NIFTY ended on a 14-year high on Closing basis. No significant formations were seen on Candles. Having a look at pattern analysis, it becomes evident that the brief consolidation that the Markets witnessed after testing immediate past high level of 10785 has in fact lent some strength to the Markets. Instead of facing a outright throwback and testing the breakout levels, NIFTY has chosen to consolidate in a given range. We believe modest up move will continue in the Markets. Having said this, with the NIFTY still not having moved past the 10785-mark, this level is still supposed to be regarded as important resistance levels for the Markets. There are possibilities that the NIFTY might show an up move and attempt to test those levels. However, it still remains vulnerable to be pushed into consolidation once again from those levels. Fresh sustainable up move shall occur only after NIFTY moves past the 10785-mark comprehensively.